Hey Everyone! 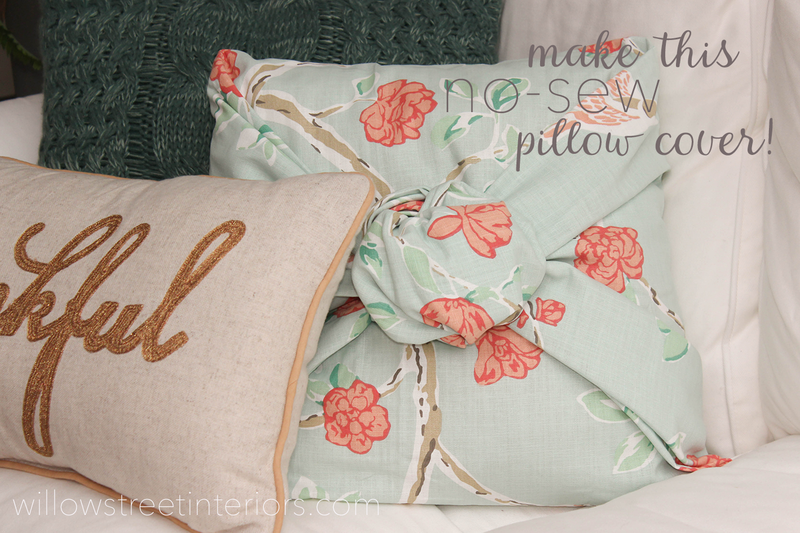 I have a really fun no-sew pillow cover tutorial for you today! I wish I could take the credit for thinking up this simple little project, but I can’t. I actually came across it a couple of years ago on a blog called Organize & Decorate Everything. 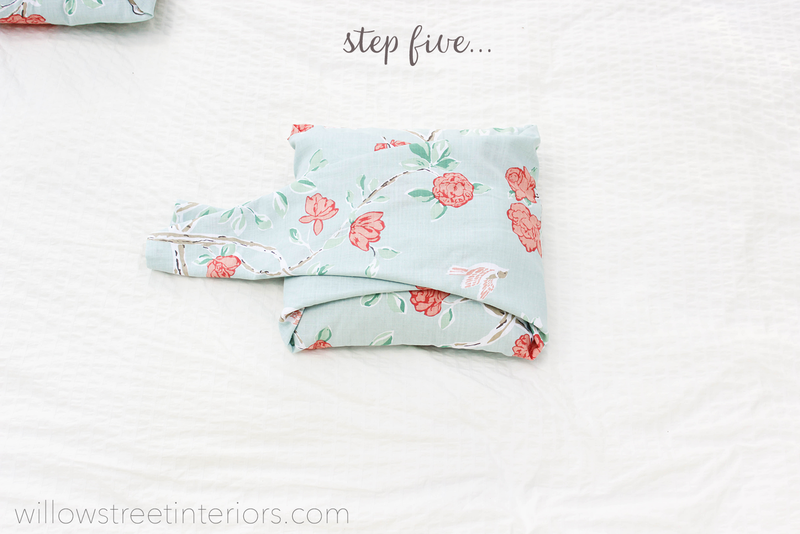 Let me just tell you, this is such an awesome way to change the look of your space without spending a bunch of money – particularly at the holidays – if you have a bit a fabric laying around. 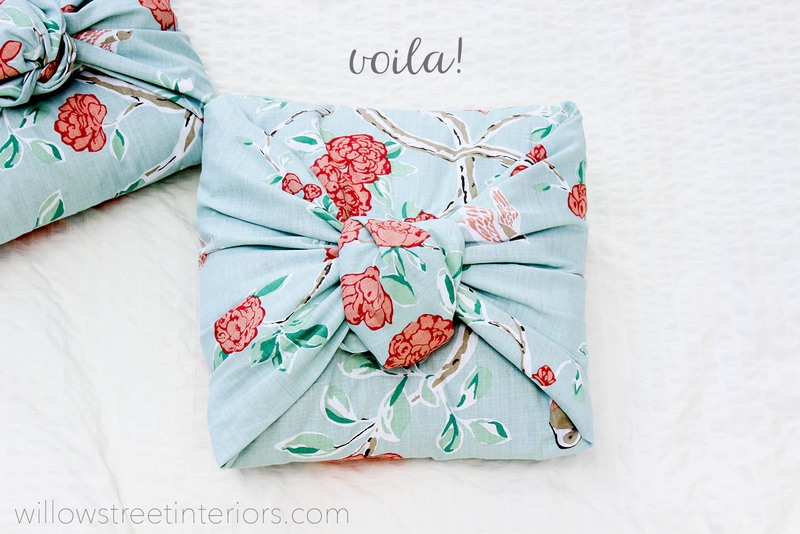 In the past, I’ve made these with curtains, sheets, older wool blankets, the options are endless really. And I’ve wanted to share this with you for so long, but just haven’t had a chance to take the photos and get this post up! I can’t imagine why! It’s not like we’re busy over here or anything. *wink. * Life can just get crazy, can’t it? Speaking of which, you should have heard how loud my house was after dinner tonight. I’m not sure how 3 kiddos can somehow sound like 23, but let me tell you, it’s possible. I’m sure some of you can relate. We try our best to keep things in balance over here – the projects, our work, our family time – sometimes we manage to and sometimes we don’t, but we t r y, and that’s probably why some of my blog ideas take me longer to get up than I’d like! But anyway, I finally got the motivation that I needed to get this post put together when a client called and asked me to come over for a few hours and help her get her house ready for the fall and winter months. She wanted to use what she already had, but make things feel fresh and a whole lot cozier. 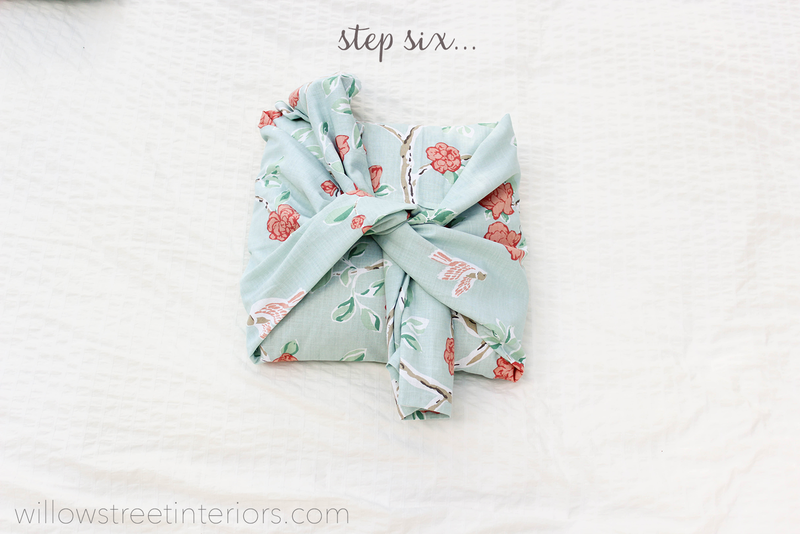 I stopped by to take a look at what she had to work with and found this adorable little shower curtain that she’d bought at Target and wasn’t using. I told her I thought it would make a fabulous pillow cover and would help us bring in some orange/red/more fall tones without having to change the color scheme of her entire room. I brought it home, along with a couple of her older pillows, and it came out so cute! 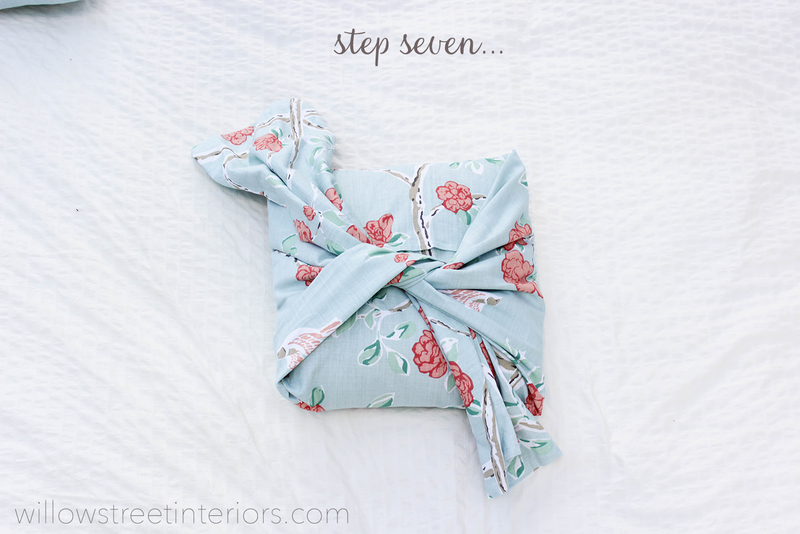 The process is basically as easy as wrapping a present! 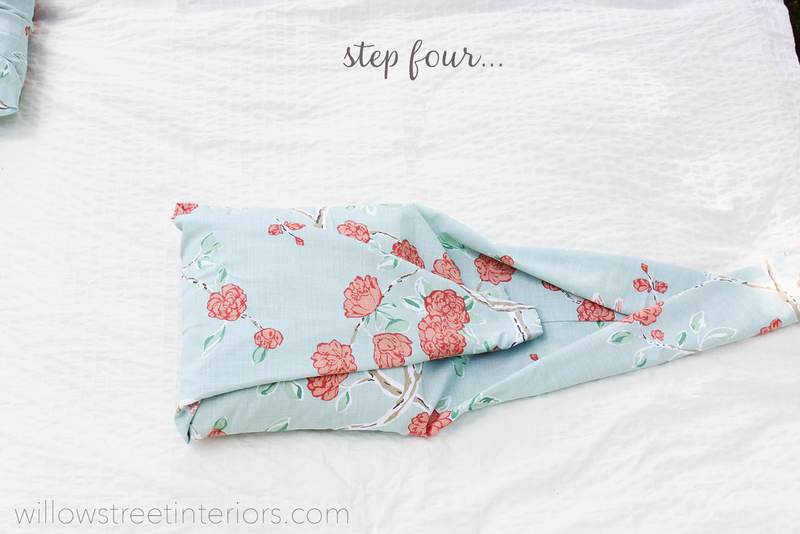 You’ll need a piece of fabric about 3 times (plus 6 inches) as wide as the pillow and two and half times as tall as the pillow. I cut the shower curtain in half and it worked perfectly for two of her smaller pillows. 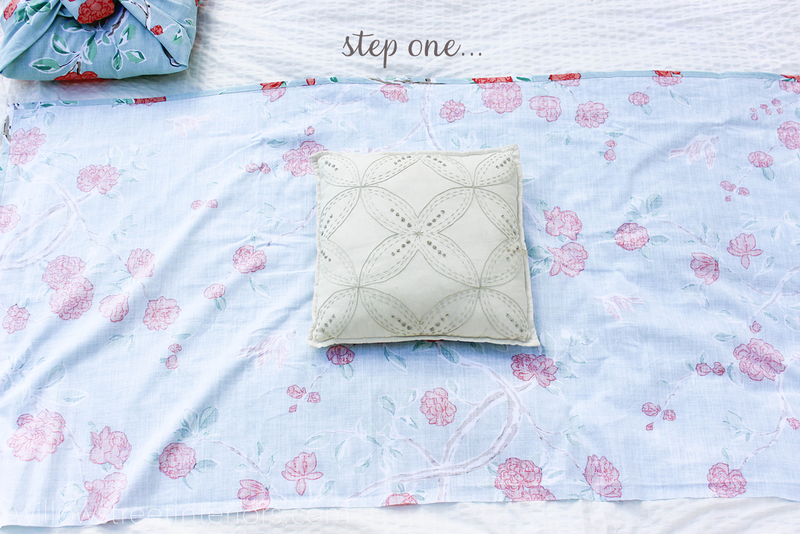 Lay the pillow in the middle of the wrong side of the fabric. 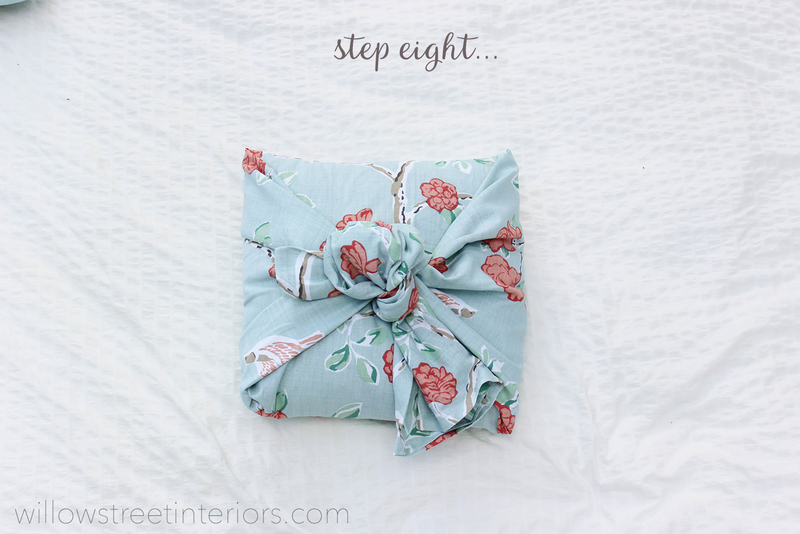 Fold the pillow up from the bottom and down from the top like you’re wrapping a present. 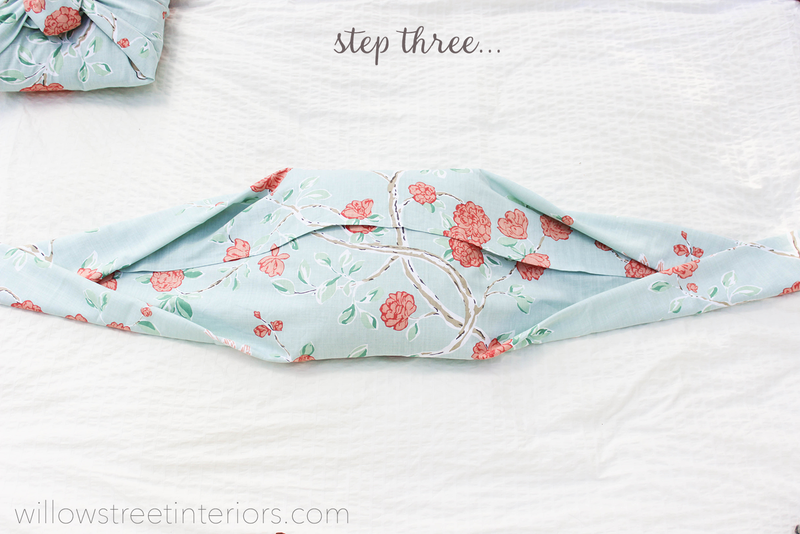 Fold the fabric on both sides of the pillow into triangles. See? Just like wrapping a present! 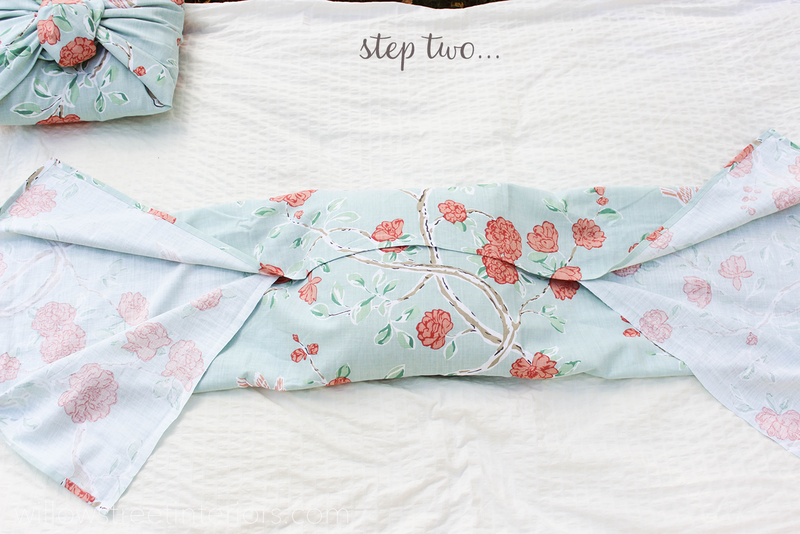 Fold the other side over, and get ready to tie a knot. 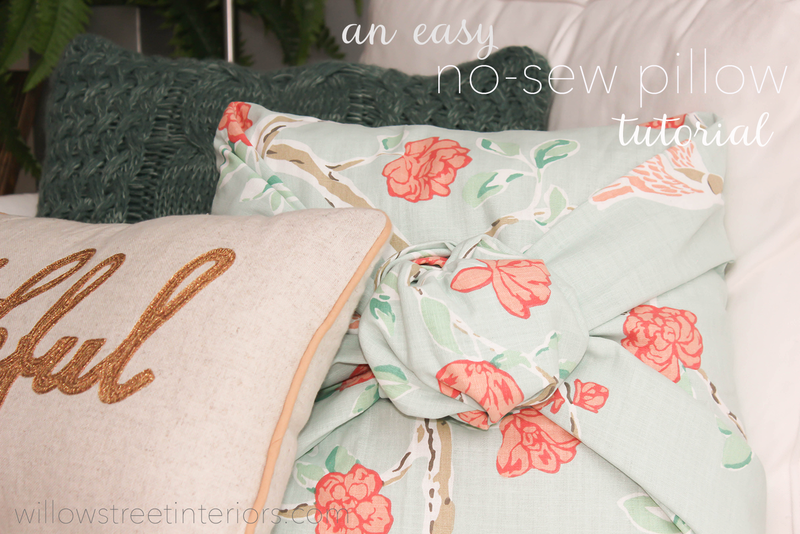 Pull fabric a little tighter and smooth it out.